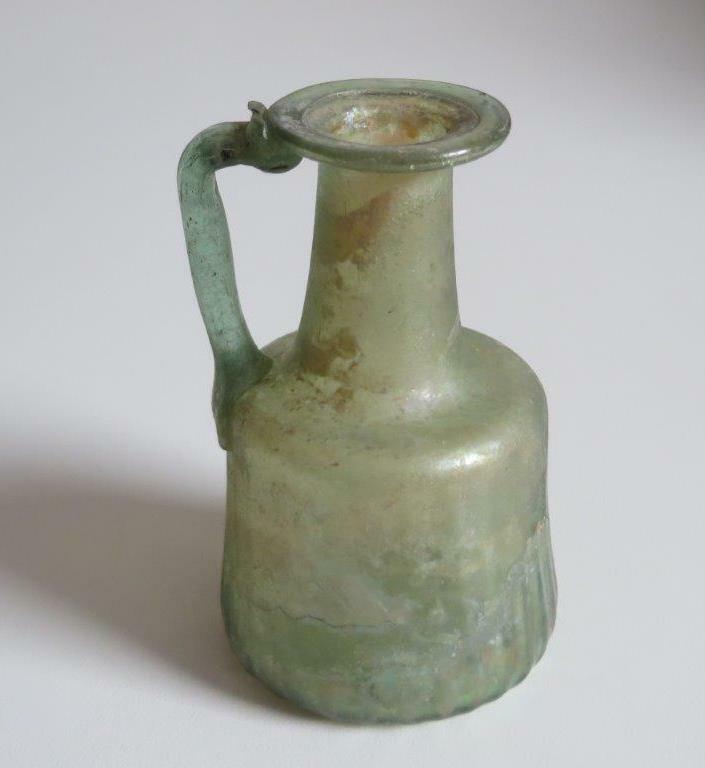 Remarks: Pale green blown glass single-handled jug with some iridescence. The cylindrical shape shows faint pattern-molded vertical ribs on the bottom half of the body. The single-handle is attached at the shoulder and pulled up to connect with the flattened horizontal rim. Technique: Free blown cylindrical bottle; rim tooled ; with pontil mark. Description: Cylindrical flask of translucent white glass. Cylindrical body slightly oval-shaped with short widening neck ending in a flaring rim almost as wide as the body. Rim folded out and inward, flattened creating a sunken neck. Concave base with pontil mark. Condition: Good, complete, no cracks, some bubbles, with little bluish iridecence, some adhering sand. Remarks: According to Isings, form 102, two varieties do exist: one has a rim folded outward and inward, flattened afterwards. The other has a more funnelshaped mouth, with a rim folded inward and rounded. It usually has a thick coil below the rim. While this version does not have the coil, it has the funnelshaped mouth and can be regarded a mixture of both types. Provenance: From a private dutch collection, first publication. No specific data of provenance known. The technique of mold-blowing all so called mold-blown is a very old method used to make glass containers and objects. 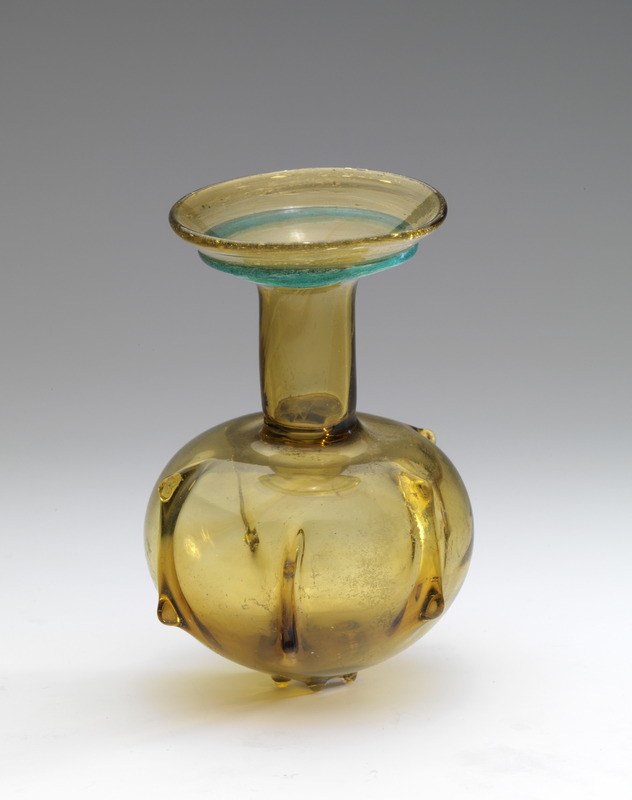 A molten glass parison (bubble) on the end of a blow pipe is blown into a mold to give shape and decoration to the vessel. It may be further inflated and worked after removal from the mold. The molds used are made of a two or three parts or the simple one part dip or optic type. 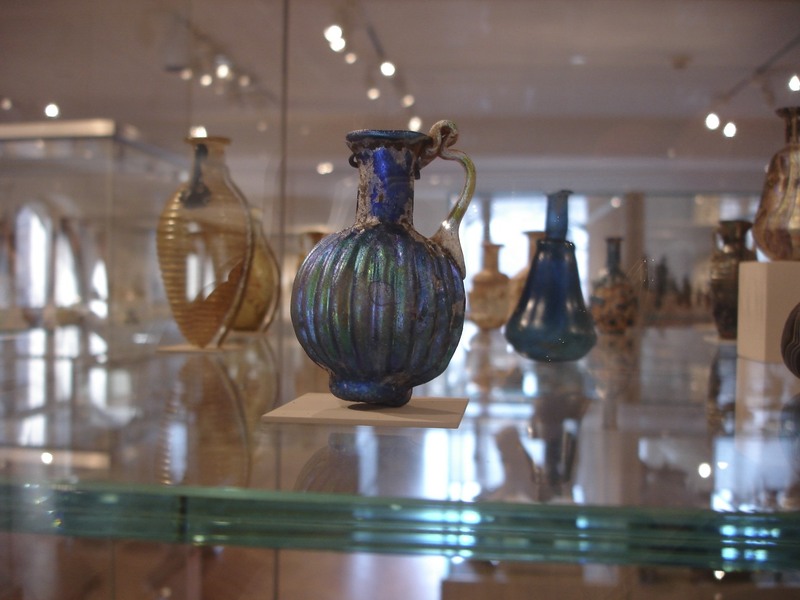 The following examples illustrate glass objects which are made by mold-blowing from the Allaire Collection and others. Click on the photo to enlarge. Technique: Free blown Jug, tubular foot ring applied. Handle and trail around neck and under the mouth applied. Mouth tooled to a trefoil shape. 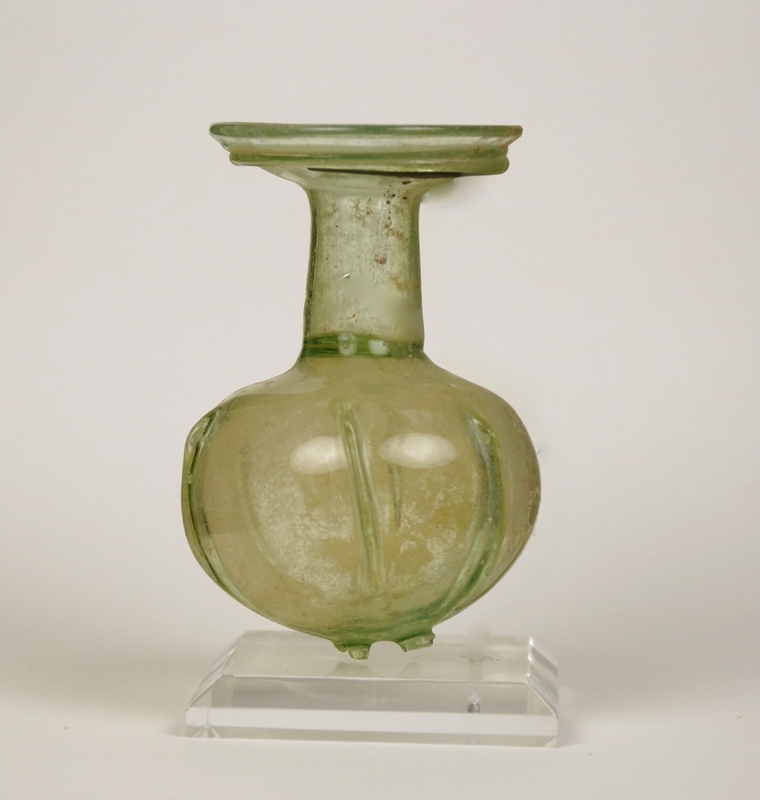 Description: Late Roman glass jug of the Constantinian era in translucent white and middle-green colour, with globular-ovoid body, cylindrical neck and trefoil mouth, green tubular ring base with pontil mark. Handle applied on shoulder, drawn up and attached to the edge of the rim in a fold. Green trail wound around neck and below the trefoil mouth. Condition: In fair condition, several stable cracks to the body. Trail around the neck halfway broken off. Remarks: Lots of adhering sand partly mixed with possibly its original content, for the glass of the body and neck are no longer translucent. There is an irregular contrast to the white semi-transluscent body and the green-coloured neck, as if the technical skill to separate the colours has failed. Provenance: From a private Dutch collection, previously unpublished. No specific data of provenance known. 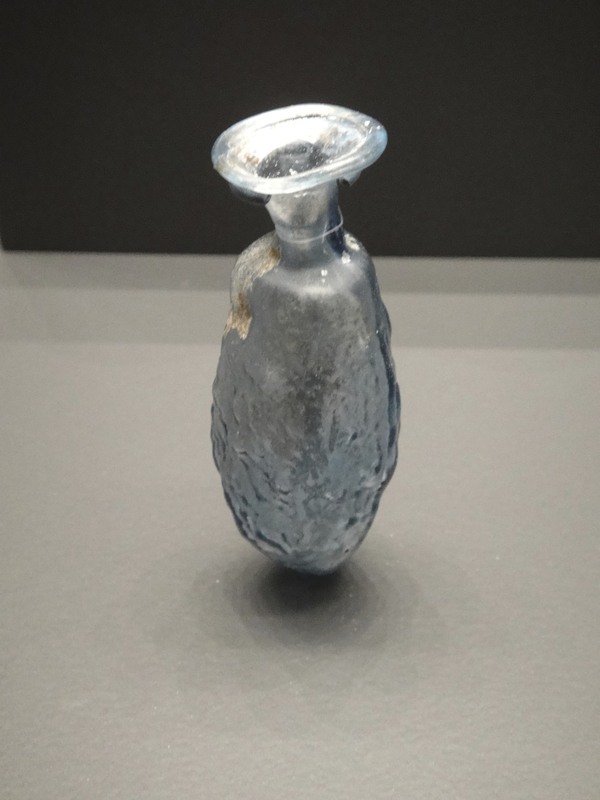 Reference: Israel Museum, 73.37.103, 4th. c. | Fitzwilliam museum 1978, no 108c. | Van Rossum 2017, The Collection Dos and Bertie Winkel, Dos82. 4th. c. | La Baume, No D66, Taf 31, 3 | Sammlung Hentrich No 213 | Hayes, No 336. | Kunina 1977, 388, 3rd-4th. c. | Harden, 1936, p 243, No 722. 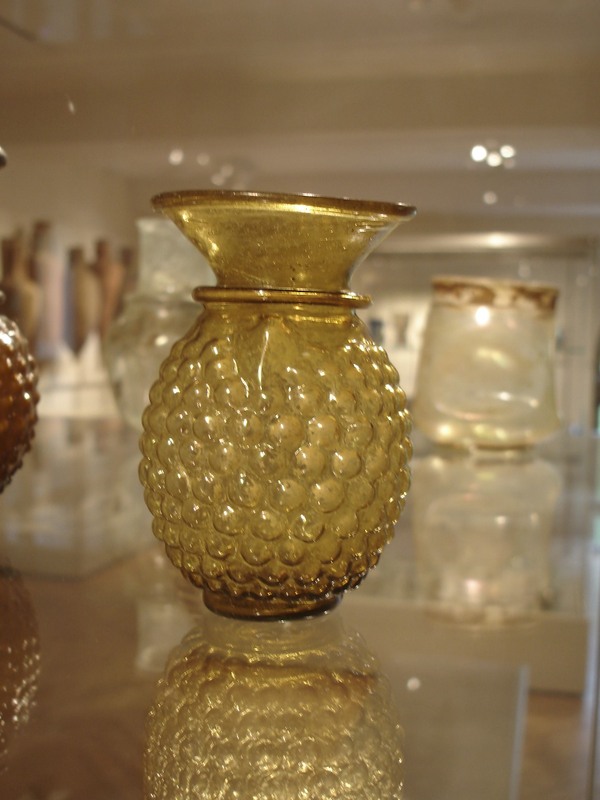 During the making of vessels, blobs of molten glass were dropped onto the surface creating a raised decoration, sometimes called prunts. 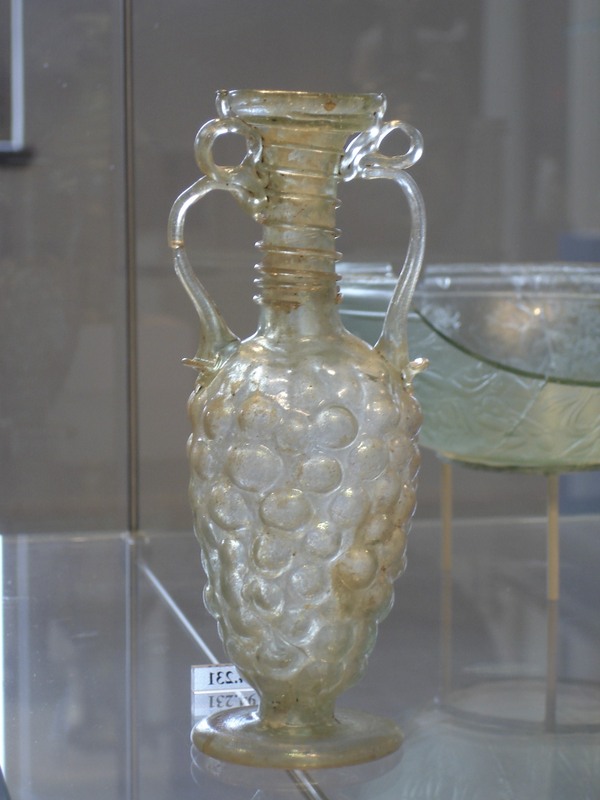 It was an option for the glassmaker to leave the blobs in an irregular smooth shape or to form a pattern such as a lion head or a raspberry design as with the German roemers. 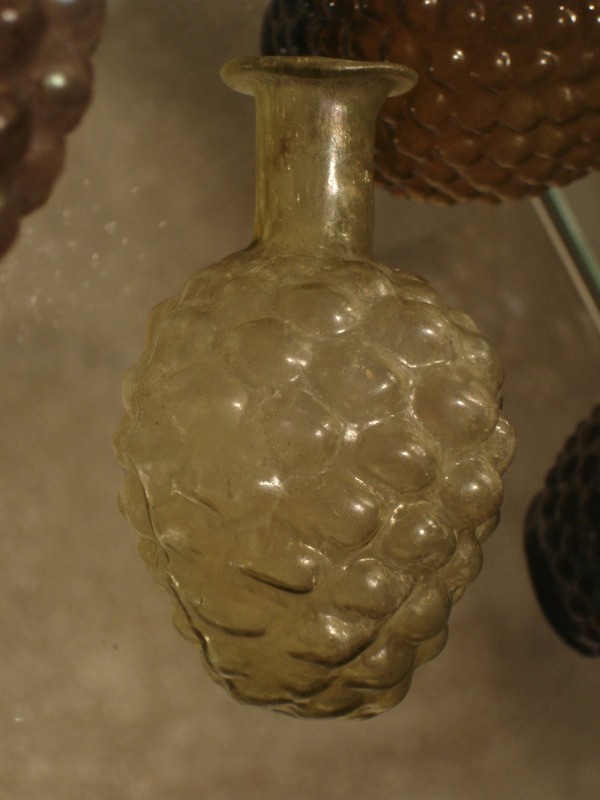 On others the hot glass blobs were pulled out with a tool forming spikes. 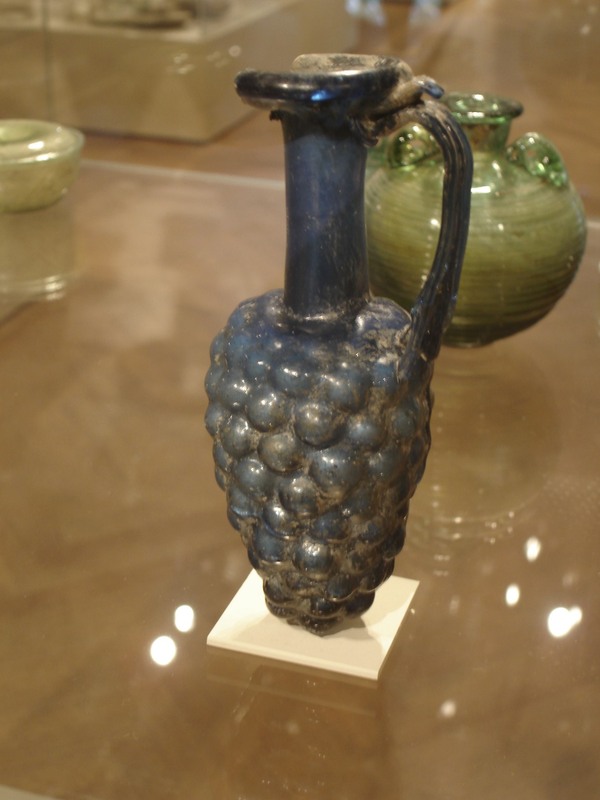 The texture of these prunts provided a firm grip on the vessel, as diners during the Middle Ages may have been eating with their fingers. The following pictures show examples from our collection to illustrate various styles of blob decoration. Early Roemer Spiked Prunts Early 17th C.
Krautstrunk Smooth Prunts 1500 C.
Engraved Roemer with Rassberry Prunts Late 17th C.
Remark: A small pale green palm cup, cracked with no weathering. 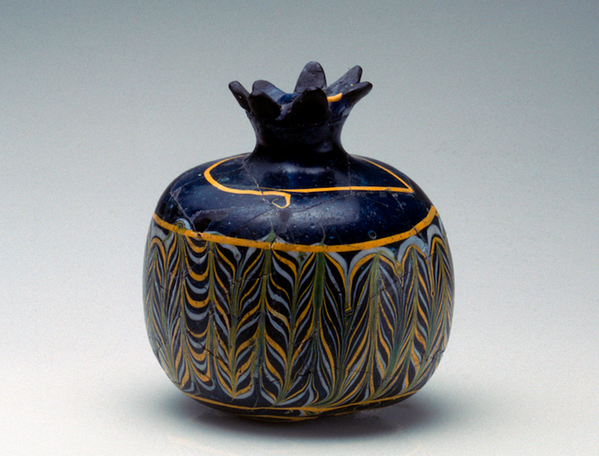 Two or more centuries later the Merovingian palm cup appeared. Provenance: The collection of Louis Gabriel Bellon. 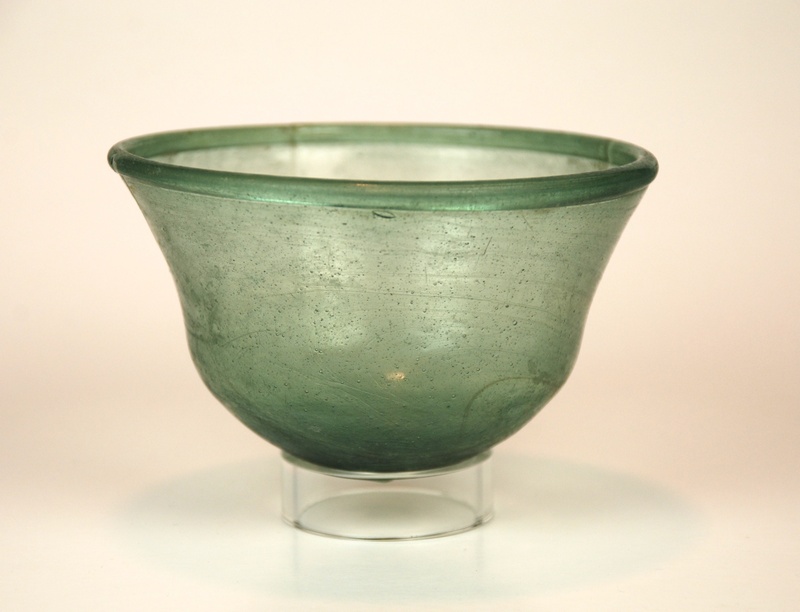 Remarks: This is a Frankish (Merovingian) palm cup of light green glass. The cup has the characteristic rounded form at the bottom and a rounded rim. Provenance: Ex: Martin Wunsch collection, NYC. Description: Small lightblue bowl with darkblue scalloped rim and darkblue hollow footring. The rim is formed as a cog-wheel with 19 teeth. Seen from above the bowl shows a starlike appearance with a beautifull two-tone light effect. Seen from the side, the foot, body and rim form a straight line with convex components. Technique: Most likely the body was formed in a mould, where-as the rim and footring were applied and tooled. Hollow bottom with pontilmark. Condition: Complete, no cracks, some bubbles and sign of time, with heavy golden irisation on the bottom and on the in- and outsides. Remarks: Isings, 1957, form 42d, speaks of only three datable specimens that are known. Whitehouse, 2001, CMG vol. II, 650, Bowl. 4th-5th c AD. Glass bowls with scalloped flange rims are unusual. Opinions on the date of these bowls have ranged from the first to the fifth century. 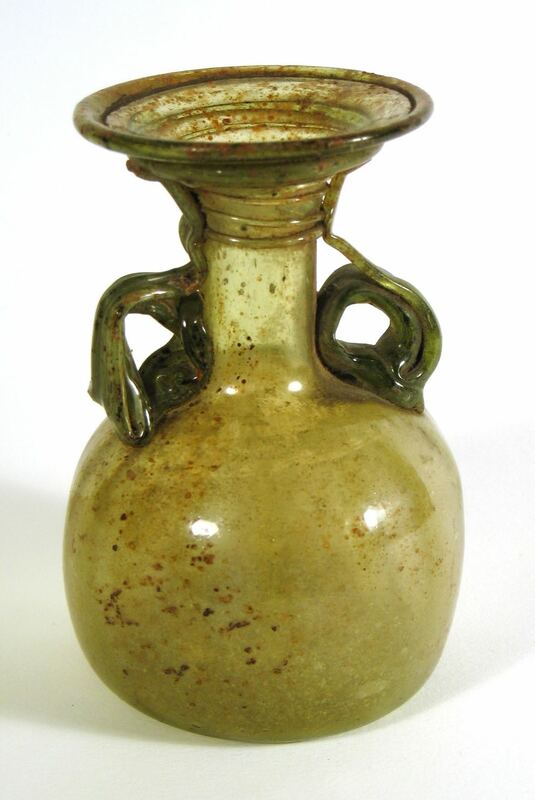 Reference: Auth, 1976, p176, 245, Persia 9th-10th c. AD (? ), Fremersdorf, 1958 vol. 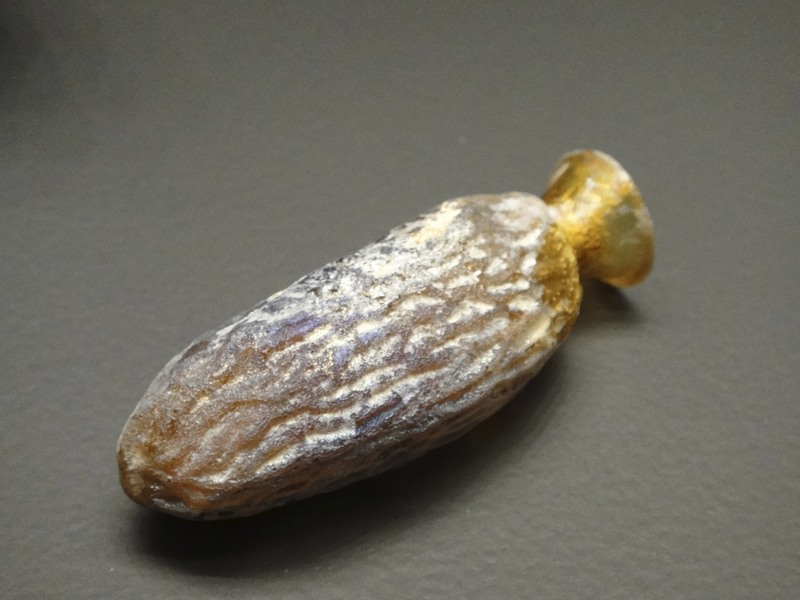 IV, Das Naturfarbenes Glas aus Koeln, Tafel 71., Harden, 1936, Karanis, nr. 257, p 111., Isings, 1957, Form 42d, p. 58, end 2nd c. AD., Kisa, 1908, p.799, fig. 320f (not: 320g), Platz-Horster, 1976, p.176, 3rd.-4th. c., Von Saldern, 1974, Slg. Hentrich 125, nr. 164, Whitehouse, 2001, CMG vol.II, 650 Bowl. 4th-5th c AD. 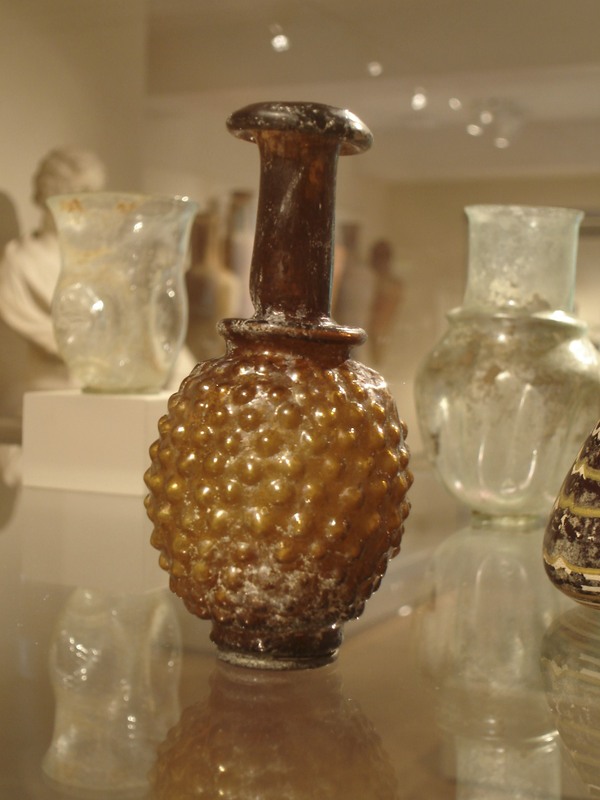 Description: Transparent pale amber glass, squat globular body with five vertical ribs, made by pinching and topped by tooled knobs. 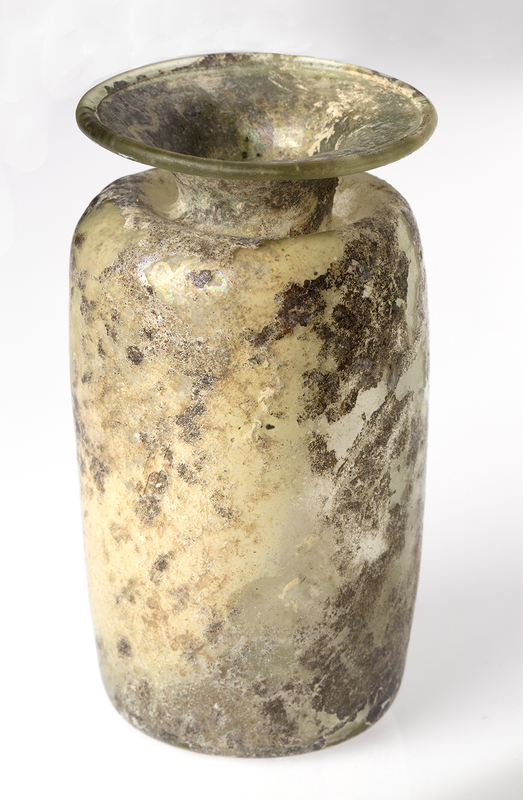 Base with five similar pinched glass ‘toes’, no pontil mark. A broad splayed lip with in-folded rim, beneath with a turquoise transparent trail of glass which was added as a highlight. 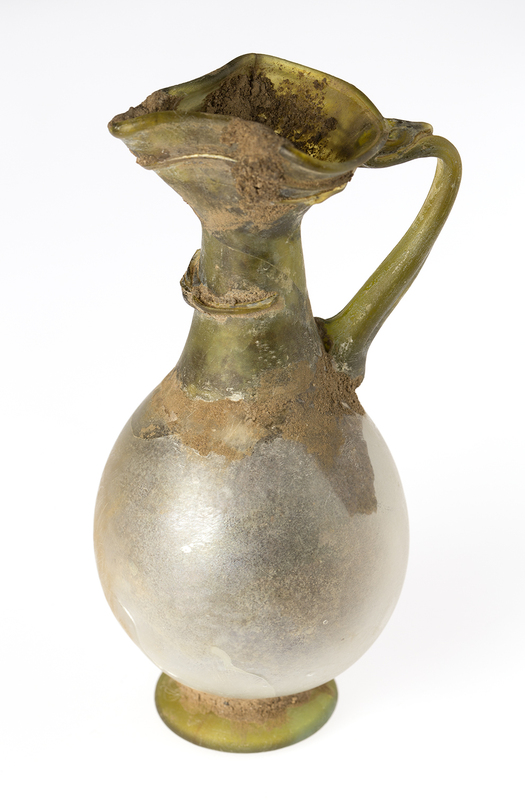 Like all sprinkler flasks this specimen has a tooled diaphragm with a hole at the base of the neck. 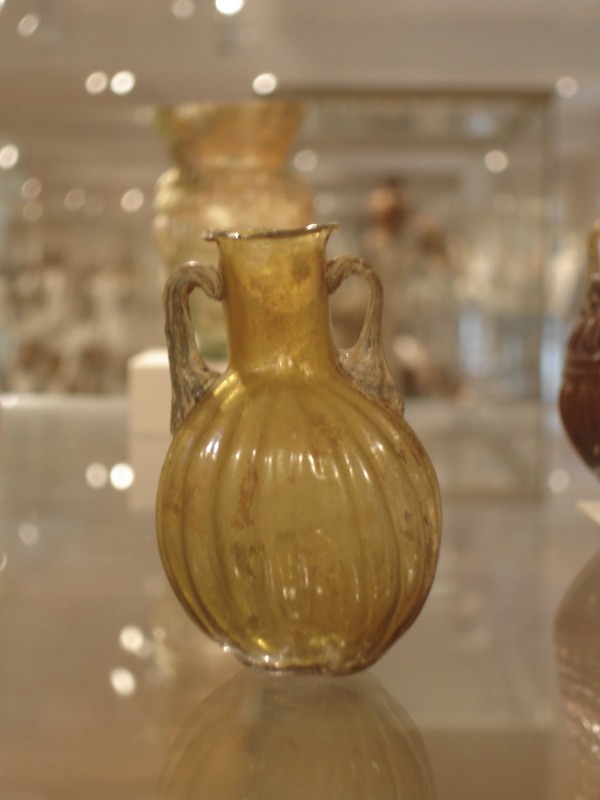 Remarks: The pinched ribs and small ring of pinched toes forming the base of these vessels evoke pomegranates, visible by turning them. The popularity of pomegranate- shaped sprinklers may have been inspired by the fruit’s symbolic associations with beauty and fertility.